During the Druidic Wars, the Academy and the Circle joined resources to develop new magics to be used in the fight. Using powerful Animal and Body magics, they created of a group of magical beings called the animen--half-human and half-beast. The first army of animen were unveiled in 245 CE and, in conjunction with the also newly formed Mage Templars, turned the tied against the Branch of Ellan's forces. It has been hundred of years since the first animen appeared in the realm and the enchantments that changed their shape changed their bodies forever. Unexpectedly, the animen could produce animen offspring. Unions between animan and animan, between animan and human, became more and more common. Generations later, the animen have become part of society though low on the social ladder. Some have become nearly human. Others still retain the strength and aggression of their beastial blood. Though the animen are accepted, there remain areas of persecution and prejudice especially in Marjor and some areas of Taus. Animen character can have a maximum of Status level one. Though the animen have no formal organization, they form a loose community often referring to each other as part of the blood and they live by a simple set of codes: to protect animen interests among humans, to ensure the survival of the blood, and to strengthen the animen blood. Prowess of most kinds earns the attention and admiration of the animen. Therefore, respect is paid to veteran and elder animen as well as to animen who have proven themselves in skill and battle. In the end, the animen will choose the strong and the fit over the weak and the frail. For game records, players must still petition and meet certain prerequisites to gain the benefits of being part animal. The petition should be in the form of a character history explaining how the character gained his or her unique bloodline. Furthermore, the player must determine his or her type of animan and chosen animal at the creation of the character. There are two lines of animen: greater and lesser. Greater animen are large, strong, and brutish with the blood of the bear, bull, lion, wolf, or drake. 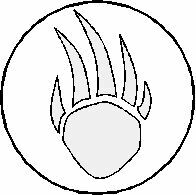 The symbol for the greater animen is a single claw. Lesser animen are lighter, agile, and swift with the blood of the fox, bobcat, eagle, or viper. 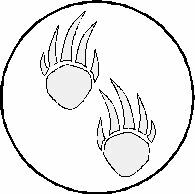 The symbol for the lesser animen are two claws. The requisites for each type are different. The points of Constitution and Feats earned by being an animan do not count toward the maximum number of Constitution and Feat points a character can have. The gained Feats and Constitution do not count toward organizational requisites.